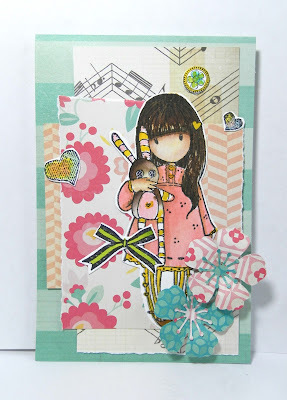 Bright and Fun Card ! Today's card is a bright and fun one using Gorjuss Girl Image: " Hush Little Bunny"
used the Cherry Blossom Die. Papers used are Crate Papers "Oh Darling". Such cute and fun papers. I enjoyed making this simple yet fun card. on your next card or project. You are sure to love it ! !